Designers are continually experimenting with diamond shapes, unique precious metals, and unusual settings to create more eye-catching engagement rings, and one of the most recent innovations, split shank diamond rings, is also one of the most noticeable. A ring's shank is the portion of the band that rises to and connects with the central setting - basically, the top part of the ring. Most rings use a single band of metal on the shank, though it may be elaborately embellished with diamonds, accent stones, metal filigree designs, or engraving. Split shank diamond rings, on the other hand, actually have a cleaved band that separates into two or three separate filaments before joining the ring's crown. The split shows the finger between the parts of the separated band. There are practical reasons behind split shanks. When a ring boasts an exceptionally large diamond or gemstone, a split shank helps balance the ring size without resorting to a wide band diamond ring that may be uncomfortable to wear; at the same time, the cleavage in the split lightens the ring both physically (using less metal) and visually (adding clear space). A split shank can also provide greater stability to a large gem, making it less likely to twist on the finger or to be bent out of its setting. A split design can also create the optical illusion of a larger gemstone, making it a stylish way to create a fabulous ring on a not-so-fabulous budget. Different numbers of splits. A single split is the most common, though double and triple splits (resulting in three or four band sections) are also available. Pave set splits. Encrusting the split band with diamonds is a popular design tactic that emphasizes the split and enhances the brilliance of the center stone. Shank width. Both narrow and wide shanks can be split, but the most important consideration is whether the width of the resulting split shank design is proportional to the ring as a whole as well as to the wearer. Split width. Some splits are only very narrow slits (usually when a narrower ring or smaller diamond is used), while others can be wider than the width of the shank. Split depth. Minor split shank diamond rings only have small splits at the sides of the center stone, while others may continue the open split halfway around the ring's circumference. Split shape. Most split shanks have simple, straight lines, but both concave and convex curves are available to add even more flair and uniqueness to this outstanding style. Attachment to the center stone. The terminal edges of the split shank may meet the central gemstone at the edges, creating the illusion of a floating diamond or tension setting, while others are aligned closer to the center of the stone, a trick that maximizes the stone's perceived size. 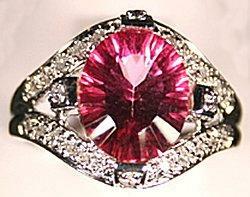 Oval split shank pink diamond ring. 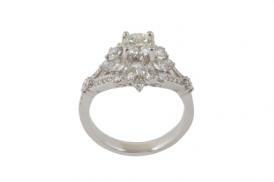 Split shank diamond rings are most common as designer engagement rings or fashion right hand diamond rings. Most jewelers will carry at least a token split shank or two, though for elaborate designs or unique features, couples may need to find independent artisans who create their own custom rings. Bridal sets are also available, and may be the best way for a couple to match a split shank engagement ring with a coordinating wedding band; the tapered design of split shanks cannot easily pair with traditional wedding rings, particularly if the split is very wide. Like any piece of jewelry, split shank diamond rings require diligent care to be kept looking their best. Dust, dirt, and debris can easily be caught in narrow splits, but it is unwise to use a pin, needle, or other sharp object to dislodge buildup - this could scratch the ring. Soaking the ring in cleaning solution can dissolve oils and dirt deep inside the split, particularly in the narrow cleft where the split begins. A split shank ring should not be worn if there is the possibility of the split becoming caught on other objects or protrusions - a sudden force could break or warp that portion of the shank. Split shank diamond rings are stunning designs that offer the unique illusion of more than one ring in a single piece. With many subtle variations available, anyone interested in these unusual rings is sure to find one that suits their personality and design preferences.